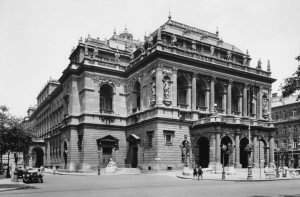 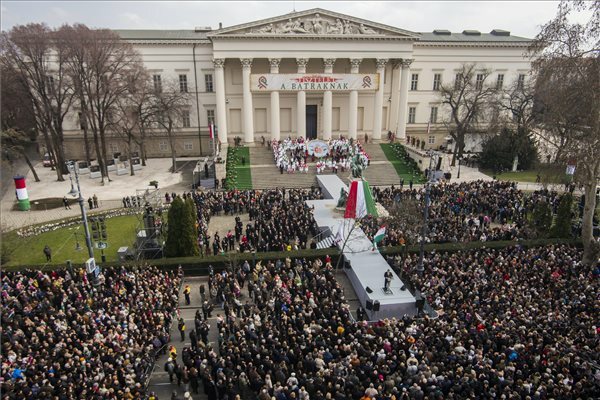 Budapest, March 15 (MTI) – Freedom and national independence have both been “guiding stars” throughout Hungary’s history, and were “benchmarks” for all generations of Hungarians, Prime Minister Viktor Orban said in front of Budapest’s National Museum on Sunday. 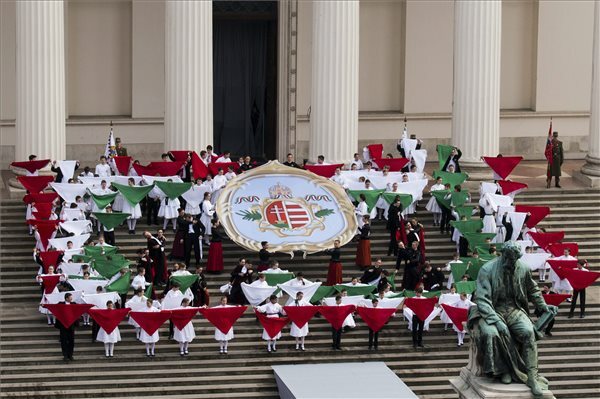 The national flag was hoisted in front of Parliament before then to mark the start of the state celebrations of the anniversary of Hungary’s anti-Habsburg revolution of 1848. 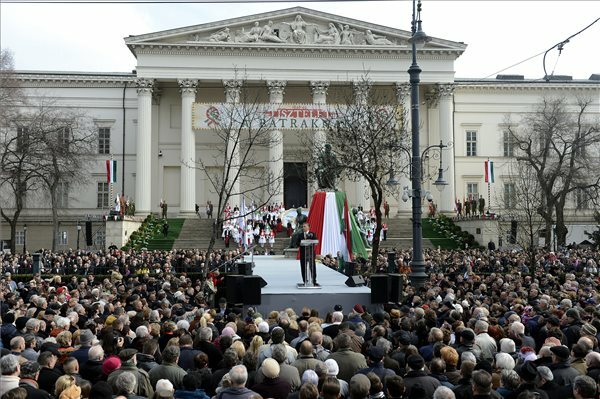 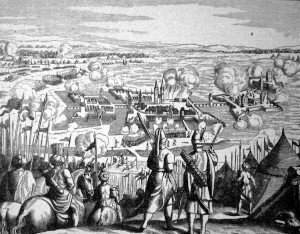 “Together, or not at all” was the lesson of the 1848 revolution, Orban said. 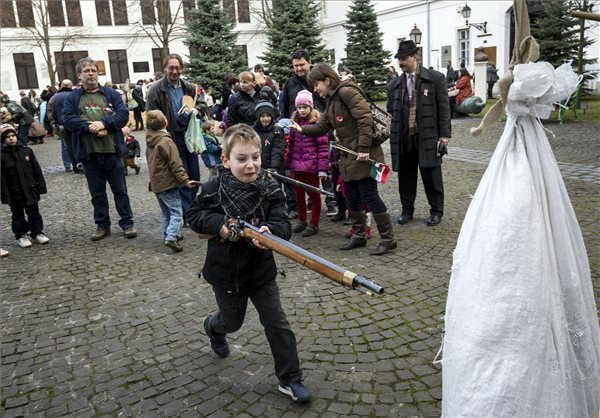 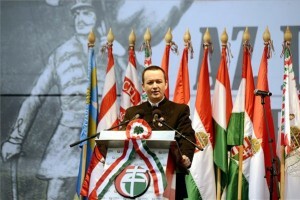 He said in the 167 years since the 1848 revolution, Hungary is still fighting for sovereignty. 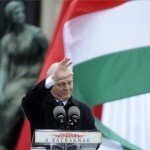 He added that Hungary is a part of Europe, but “while Europe is full of questions, Hungary is full of answers”. 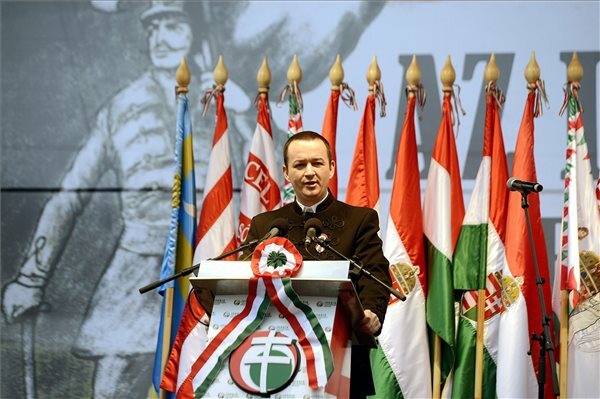 Mayor of Budapest Istvan Tarlos joined Orban at the National Museum in calling for cooperation to achieve national goals. 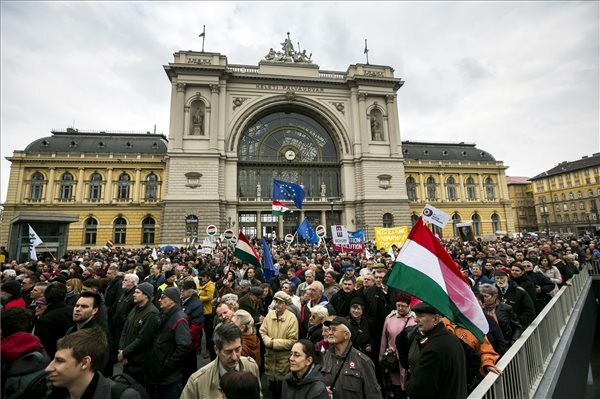 There was hissing in the crowd and anti-Orban slogans were chanted during the speeches; one man was detained. 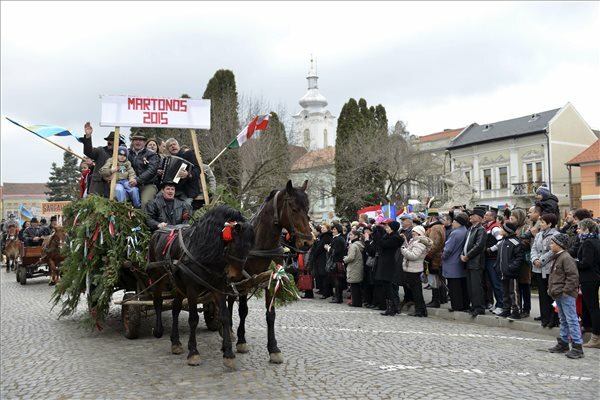 Opposition leaders also marked the holiday in various locations. 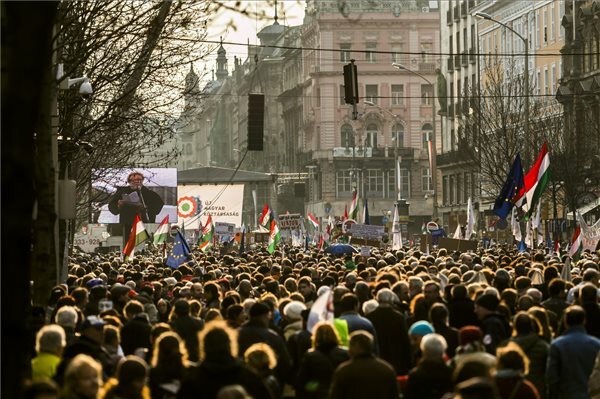 Jozsef Tobias, head of the Socialist Party, said he would challenge Orban to a public debate on democracy and insisted that a small elite was “pushing millions into poverty, and restricted the freedom of the media” because “Orban’s rule is selfish and feudal”. 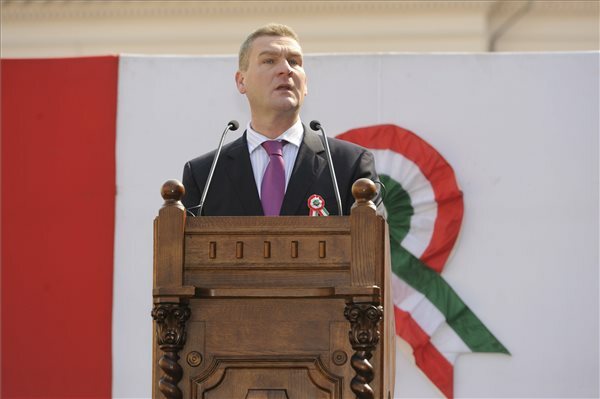 Ferenc Gyurcsany, leader of the leftist opposition Democratic Coalition (DK), said in 2015 Hungary was unable to celebrate press freedom, rather it was marking the “oppression of the press”. 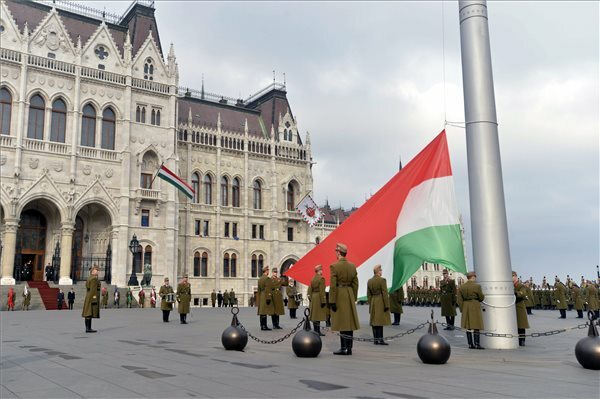 Andras Schiffer, co-leader of the green LMP party, gave warning that “a new dependence will not eliminate another, but will steer the country into a fatally vulnerable situation”, referring to the contract on a Paks nuclear upgrade Hungary had signed with Russia. 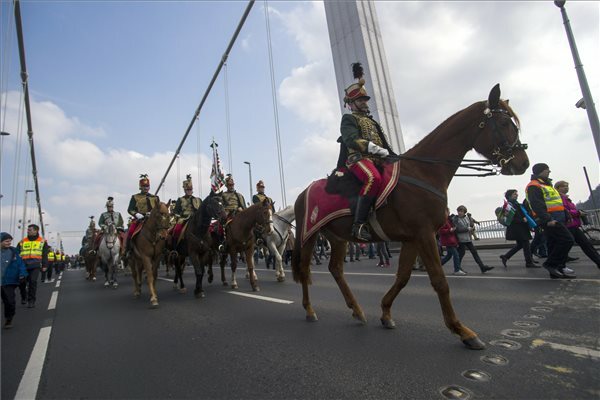 There is no democracy where “the country’s energy supply is consigned (to a foreign power)” based on a pact classified for thirty years, he said. 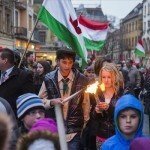 The radical nationalist Jobbik party called for “a free, independent and respected Hungary” to be created, at its own celebrations. 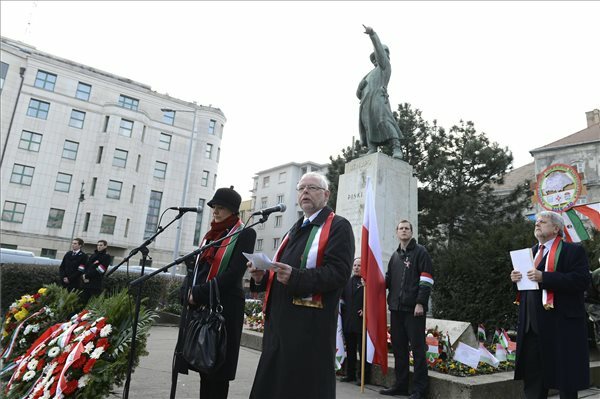 The party also announced its “genuine friendship” with its Polish sister party, the National Movement (RN), which it said was not a “political trick” like the friendship between Hungary’s ruling Fidesz party and the Polish Law and Justice (PiS) party. 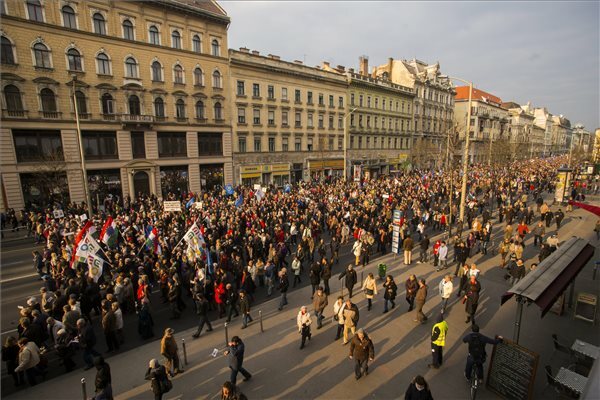 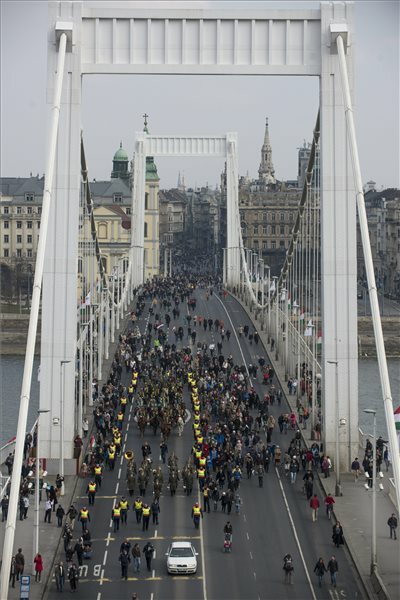 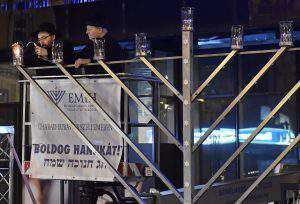 An anti-government demonstration was organised on the afternoon of the March 15 holiday in Budapest by civil groups and opposition parties. 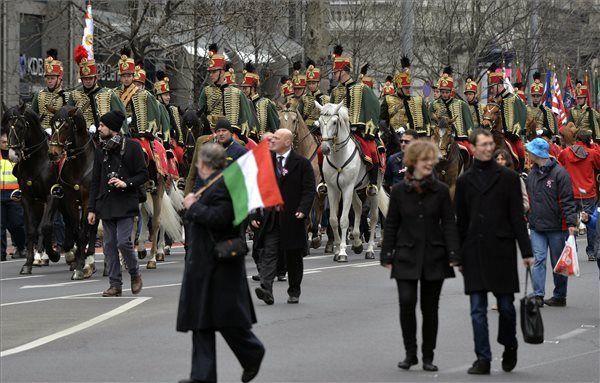 A march from Keleti railway station ended at the Astoria junction under the slogan “For a New Hungarian Republic!” Organisers said the march was for “freedom, civic equality, equality in burden sharing and independence”, and restoring the republic crushed by the Fidesz government. 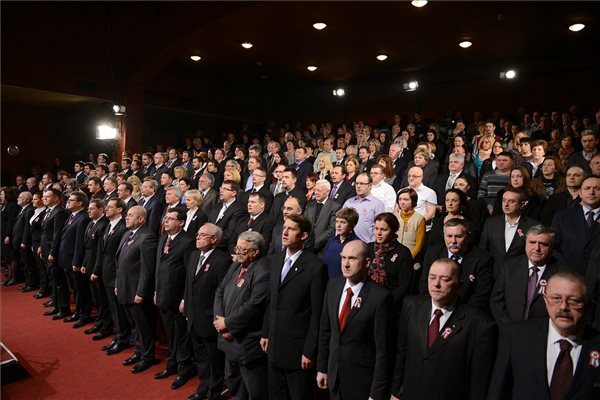 They also announced 19 referendum questions that would be put to the national election board for approval on various subjects, including anti-corruption, economic, educational and social goals, the elimination of the state’s tobacco monopoly, opening up secret files on key state investments, and free use of motorways. 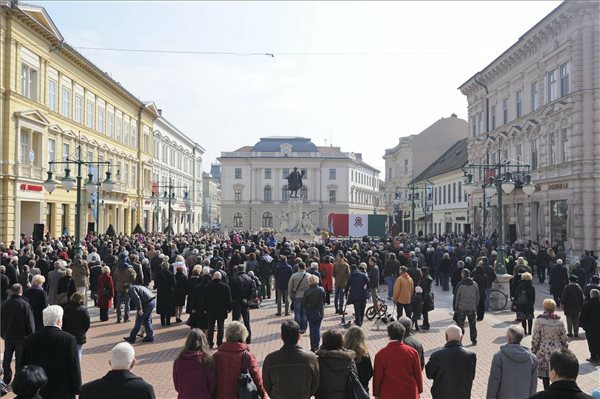 The civil groups also pledged support for referenda against retail closures on Sundays and for transparent public procurements. 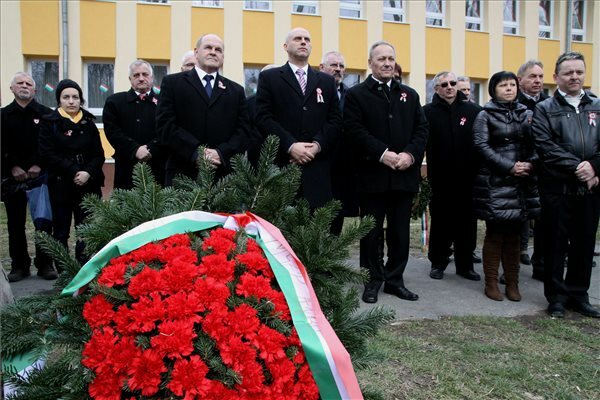 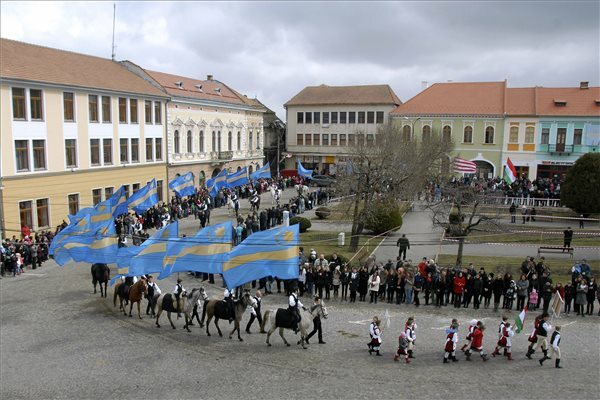 The opposition Egyutt (Together) party held commemorations in Debrecen (E) and Pecs (S). 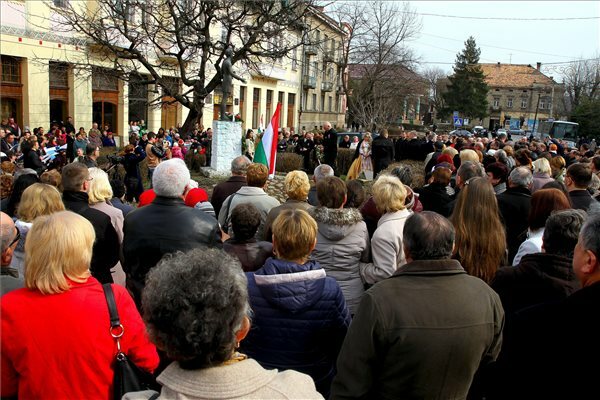 Deputy leader Peter Juhasz said in Pecs that opponents of the government needed to build grassroots movements and refuse to accept that those in power were impossible to overcome. 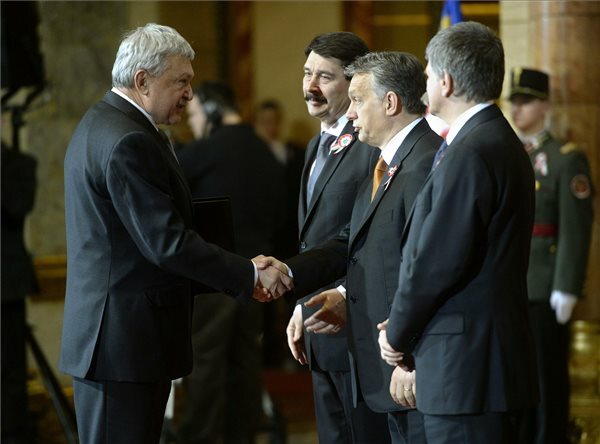 President Janos Ader talked about the importance of hard work in everyday life when he presented high state awards, including the Order of Merit, Grand Cross to Sandor Csanyi, CEO-president of OTP Bank. 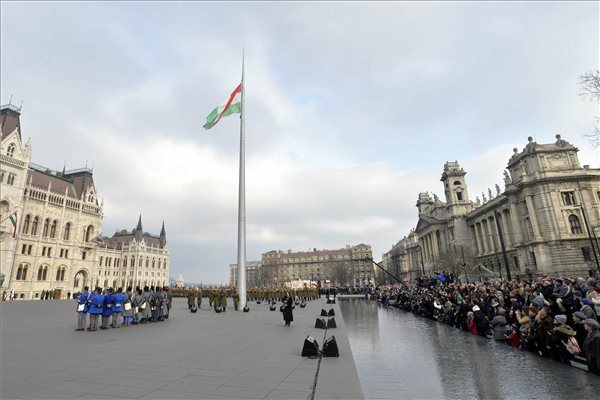 Orban greeted Hungarians living beyond the country’s borders in a letter on the occasion of the anniversary of the 1848/49 revolution and freedom fight, Bertalan Havasi, the prime minister’s press chief, said.